FTW, December 18, 2001 -- The past year has seen events unprecedented in the history of this country, from the installment of George W. Bush as president due to an extremely controversial 5 to 4 decision of the Supreme Court to the horrific terrorist attacks of 9-11. These events seem unreal and beyond comprehension. Many people have been left wondering why the presidential coup and why the terrorist attacks. Many people have assumed that the last presidential election simply resulted in a political squabble due to the close vote. A few have opined that this squabble resulted in a power grab by one segment of the elite in this country. As for the events of 9-11, the established line is that this was due to evil people who hate freedom and democracy. However, many people have sought to explain that these terrorists were bred by decades of imperialist intervention undertaken by this country in order to keep secure the privileged position of US corporations and the US public in general. There are a small few who have wondered whether the events of 9-11 were the work of Islamic terrorists at all, just as there are a few who believe that the Bush regime staged a coup in every sense of the word. The wisest and best informed say all of this is about oil. To understand the events of the past year, it is first necessary to set the scene. And the scene in which all of these events have played out is the approaching end of the oil age. This background has not been talked about in the mass media, or even in the alternative media. However, this knowledge is essential in order to understand not only what has transpired in the past year, but also the events to come. And we need this knowledge in order to consider what actions we should take to assure a positive future for all. The civilization we live in today is based entirely on hydrocarbons (by which term I mean both oil and natural gas). The energy which runs our technology is derived from hydrocarbons. The energy which does our work is derived from hydrocarbons. The energy which powers our homes, our transportation and which generates our electricity is all largely derived from hydrocarbons. All of the plastics which surround us with consumer goods are derived from hydrocarbons. Our produce is fed with hydrocarbon-based fertilizers and sprayed with hydrocarbon-based pesticides. Every person in the US has the energy equivalent of a dozen slaves working for him or her. In short, there is no other source which can provide for the energy needs of our present civilization. Hydrocarbons are considered a nonrenewable resource. Many millions of years ago, atmospheric carbon was absorbed by ocean waters and ultimately processed into living matter. Millions of years ago the oceans abounded in microorganisms. Life forms similar to plankton were far more abundant than they are even at the present time. As these organisms died their bodies settled on the ocean floor, forming an organic ooze. It is interesting to note that the planet was incapable of supporting terrestrial life until much of the carbon had been leeched from the atmosphere. Atmospheric carbon is a poison which had to be locked into sediment by ocean life before land-dwelling life forms could evolve. Once this organic ooze was deposited, it had to be buried in sediment and subjected to just the right combination of conditions in order to transform it into energy rich hydrocarbons. The combination of pressure, heat and time is very precise. Too much pressure will transform the carbon to graphite. Too much heat will overcook it. Finally, once the ooze has been transformed into hydrocarbons, they will migrate through the Earth's crust until captured by the "trap." A trap is a non-permeable geological formation which holds the hydrocarbons and prevents them from escaping. Without a trap, the hydrocarbons will migrate to the Earth's surface and dissipate into the atmosphere. All of the conditions for hydrocarbon generation have only been met once in the history of the Earth. It is arguable that the process of transforming atmospheric carbon into hydrocarbon deposits itself altered atmospheric, oceanic and earth chemistry, as well as the biosphere, in such a way that the process will never be repeated, it would take millions of years for hydrocarbon deposits to be replenished. And so hydrocarbons are a nonrenewable resource which we are using up at an alarming rate. 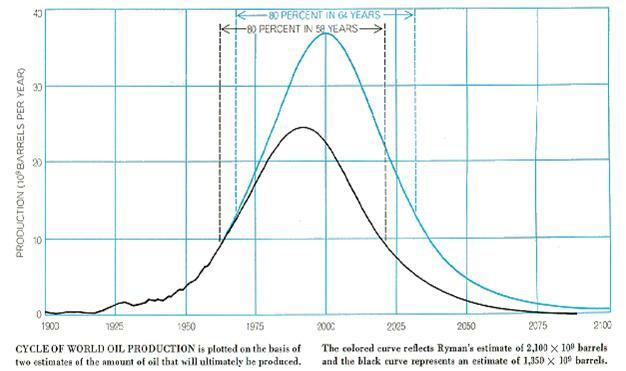 The production of oil from any given field follows a bell curve. After discovery of the field, production increases as more and more wells are opened. A team of exploration geologists and engineers will quickly map out the field and develop a pattern of well placement so as to maximize production. Each well has a cone of production which, when well placed, will cover the entire field. If placed too closely, the cones of production will overlap and the overlapping wells will each wind up producing less. So, to increase production by drilling more wells only works until the field is covered, beyond which point adding more wells only leads to diminishing returns. Because of this, there is a point where the production of any particular field is maximized. This is the peak of the production curve. The peak can be narrow or broad, short or long in duration, but production will never be increased beyond this point. In the earth, oil moves at a very slow rate. The classic gusher effect is due to the fact that oil at depth is held under pressure. When a hole is drilled, the oil in the area immediately around the hole is ejected by this pressure. Once this oil has been pumped, the well must draw oil from farther away. Under its own impetus, oil travels at a very slow rate, the same rate as damp spreading through a stone foundation. Once a well has pumped all of the oil in its immediate vicinity, the rate of production must drop. We have techniques for boosting the draw of a well, such as pumping in water under pressure at other sites to drive oil to the well. But production will inevitably decrease. This is the downward side of the production curve. On this downward slope more and more energy is required to pump oil from a field, until a point is reached where it takes as much or more energy to pump the oil than can be extracted from the oil. At this point the wells are closed and the field ceases production, forever. This is the trend for every oil field ever discovered: increasing production, peak production, and declining production. Even fields as immense as those in Saudi Arabia follow this pattern. US oil production did peak in the early 1970s. To meet its rising energy needs after this point the US became increasingly dependent on foreign oil. This paved the way for the Arab oil embargo. By the end of the decade, US oil production had begun to decrease irreversibly. Whatever anyone tries to say to the contrary, our dependence on foreign oil is permanent and increasing all the time. Dr. Hubbert was vindicated, and his is now the standard methodology for projecting oil production. Now that we have this background in place, let's reflect on the events of the past year. One of the first acts of the Bush administration was to declare an energy crisis and delineate a controversial set of measures for solving this problem. On the surface, the Bush energy package called for increased domestic production. This is the favored solution of certain mainstream, free-market economists, who believe that increased production is the answer to current energy woes while research and development of new technology will take care of the future. Most mainstream economists refuse to realize that hydrocarbons are the underpinning of our technological civilization, instead of just another commodity. And, of course, increasing production has great appeal to businesspeople whose prime concern is maximizing short-term profit. Under the surface, however, the Bush energy package is a give away for the oil industry, and a strengthening of US commitment to support corporate oil interests. The energy package sought to give away drilling rights in the Alaskan National Wildlife Arctic Reserve (ANWAR) and other remaining wilderness areas, open up our continental shelves to full exploitation, role back environmental and health regulations, and subsidize the oil industry with major tax breaks. One controversial measure which received very little attention was an item allowing energy corporations to extract resources from public land without paying for the right to do so. The Bush energy plan was a giveaway for energy corporations. It met with stiff opposition in congress and certain prized measures such as drilling in ANWAR were defeated. Related to the energy package was President Bush's withdrawal from the Kyoto Treaty on global warming, which action was reviled around the world. In his first months in office, Bush managed to alienate almost every country on the planet in one arrogant move after another. When asked what he would do should Canada seek to limit natural gas flow to the United States, Bush said he would do whatever was necessary to protect our right to Canada's natural gas. Likewise, at home, he was highly reviled by many US citizens. There was even some talk of impeachment. All of this changed after 9-11, and it is to be wondered how the Bush administration would have survived without the terrorist attacks. It is now early summer of 2001, and the Bush administration informs Pakistan and India that it will launch a military mission against Afghanistan before the end of October.19 , 20 This is the same Afghanistan to which the US gave 43 million dollars just a couple months before to aid them in destroying their poppy crops; that on top of 132 million given to the Taliban in the previous year. 21 , 22 At the time Secretary of State Colin Powell informs Pakistan and India of US intentions there is no animosity between the US government and the Taliban, despite the fact that the Taliban is openly harboring wanted terrorist Osama bin Laden. In the months prior to the terrorist attacks, there were many warning passed around various levels of the government and elsewhere. David Schippers the Republican lawyer who pressed impeachment against President Clinton, claims he spent months before 9/11 trying to get information to Attorney General Ashcroft from FBI agents who claim they were told not to investigate leads that suggested a terrorist attack on Manhattan was imminent. 29 The New York Daily News stated that some Middle-Easterners in New York were forewarned of the attacks.30 Bin Laden had warned a few months previously that he and his followers would undertake an unprecedented attack on US interests. 31 Finally, on Friday, Sept 7, the State Dept issued a worldwide terrorist alert to Americans abroad.32 It is hard to believe that no one in the US intelligence community had knowledge of the pending attacks. Between 7:45 and 8:10 EST, the morning of September 11th, four US passenger jets were hijacked simultaneously. This was an event unprecedented in US history and should have set off all sorts of alarms by itself. Nothing was done. The FAA had all four planes on radar the whole time. 35 minutes later, American Airlines flight 11 crashed into the World Trade Center. The air force was not scrambled. President Bush was not even informed. After another 18 minutes, United Airlines flight 175 struck the second tower of the WTC. Bush is briefly informed of these events as he attends a 2nd grade class in Florida. Instead of taking emergency actions, Bush continues with his lessons. Another excruciating 37 minutes pass during which nothing is done. Radar tracks American Airlines flight 77 as it flies by Washington D.C., makes a tight spiraling descent, descending 7,000 feet in 2.5 minutes, and levels off to fly straight into the Pentagon at 640 knots, clipping power lines along the way. Some time later, United Airlines flight 93 crashes in Pennsylvania. Witnesses report debris falling from the plane many miles before it hit ground. There has been a lot of speculation about the intended target of this 4th plane. Some say the target was Camp David, some the White House. It has also been speculated that this craft sought a midair collision with Air Force One. We will probably never know its intended target. However, it is interesting to consider if the target of flight 93 had actually been the Capitol Building. Had this jet struck congress, President Bush might have temporarily assumed the powers of congress. After 9-11, President Bush's approval rating rose to 80%. A wave of patriotic hysteria has washed over the entire country, giving Bush the mandate he so desperately desired. Instead of seeking out the perpetrators and bringing them to justice through legal channels, Bush declared war on all terrorists and on any country which harbors or supports terrorists. This is to be a very long and open-ended war, without specific goals against which its success and eventual resolution can be measured. Operation "Infinite Justice" as it was originally called. The US public must prepare themselves to suffer and sacrifice while the war itself will be fought largely in secret. All the while, the public is being kept in a state of alert with threats of anthrax exposure and other vague terrorist alarms. The anthrax attacks are themselves extremely peculiar. The Bush administration wants to point the blame at Iraq, while the FBI and other investigators believe them to be the work of homegrown, probably rightwing, terrorists. Yet all the leads seem to evaporate into thin air. The main targets, media and Democratic Senator Tom Daschle, make little sense if the perpetrators are Islamic extremists. Those who would benefit the most from these attacks are President Bush and his administration, as the attacks only serve to scare the media and his political opposition further into his protective arms. Finally there is the ineffective nature of the attacks; for the most part, the exposures are easily treated with antibiotics. It would be easier and more effective to use letter bombs. That is, unless your goal was to instill fear in the media, the political opposition and the general public without massive casualties. Lastly, the assault on Afghanistan began just as planned. And the US now has the excuse to attack any other nation it pleases. All that is required is to first label them as terrorists. Beyond this, the War on Terrorism, gives the US a perfect excuse to seize control of major oil deposits in other countries such as Iran and Colombia. Likewise, it legitimates a police state within the US so that the elite can prepare for the day when the common people of this country are impoverished and starving due to the collapse of oil-based civilization. The Elite will maintain their own comfort and their average of twelve energy slaves per person. Here then, is the scenario. Wary of the peak and approaching decline of hydrocarbon production, the oil and defense elite in this country back a political coup to put their people in the White House. However, this oil administration can do very little toward achieving their ends because of unpopularity at home and abroad. In growing desperation, this regime provokes and permits, if not outright planning the enterprise on its own, a massive terrorist attack against the US homeland, striking at the very symbols of globalization and US imperialist military might. Perhaps failing in an attempt to attack congress which would then give the president the opportunity to "temporarily" suspend the constitution and assume sole power. This terrorist act negates all opposition to the regime and gives them the authority to do whatever they wish internationally and domestically to protect the interests and the positions of the oil elite. This scenario may seem farfetched but no other theory can explain as adequately all the events of the past year, given the facts that are known and the background of the approaching end of the oil age. Even if you don't believe the events of the past year were intentional, that does not change the picture of the future before us. We stand at the dusk of oil-based civilization, and the US is preparing for the approaching night by extending its military might throughout the world and instituting a police state at home. Global oil is peaking; in five years we will no longer be able to produce enough oil to meet the needs of our oil civilization. The oil elite wants to grab the remaining supplies and dictate their use. Likewise, the people of this country, who will soon be faced by starvation and extreme impoverishment, can be held in check through the establishment of a police state. All the while, people are being diverted from seeing that we have just enough energy resources left that we could build a true ectopian democracy where all of us could lead freer, healthier, more fulfilling lives. We need bottom up democracy. We need small-scale economies, and small-scale technologies powered by renewable energy. We need smaller communities, structured to be self-sufficient, all tied together by high speed monorails. We need gardens and parks in our cities instead of cars. We need social halls, not shopping malls. And we have enough energy remaining to do this, if we act now. The oil elites, however, want to use our remaining energy resources to establish a security state where they can enjoy the remaining riches while the rest of us suffer, starve and slave for them. Yet they are not the ones pulling the triggers and enforcing the rules. We are. And that's what they fear most. So tell me, what do you think we should let happen now? 3 Environmental Accounting: Energy and Environmental Decision Making, Howard T. Odium, Wiley, 1996. From page 314, we find that in 1993 total USA fuel use was 4.78 x 10e24 sej (increasing about 2% per year ever since). From page 187 we find that total net solar radiation absorption for Alaska and the lower 48 was 4.48 x 10e22 sej. In other words, the USA is presently using fossil fuels more than 100 times greater than the total absorption of solar radiation across the entire USA! 10 BEYOND OIL, by John Gever et al., pp. 65-68, Univ. Pr. Colorado, 1991. 11 GeoDestinies, by Walter Youngquist; National Book Company, 1997. 12 The Betrayal of America: How the Supreme Court Undermined the Constitution and Chose Our President , by Vincent Bugliosi, Thunder's Mouth Press/Nation Books, 2001. 13 The Oil behind Bush and Son's Campaigns by Ranjit Devraj, Inter Press Services, 5 October 2001; Posted at globalresearch.ca 15 October 2001. 14 George W. Bush's Dubious Friends , Intelligence Newsletter, 2 March 2000; Posted at globalresearch.ca 1 October 2001. 15 BUSHLADEN by Jared Israel, Emperor's Clothes; 8 October 2001. 16 Judicial Watch: Bush/bin Laden Connection "has now turned into a scandal! ", Jared Israel, Emperor's Clothes; posted 6 October 2001. 17 The Carlyle Group , Alfred Mendes, Spectrezine. 21 Bush sends Money to Taliban while Planning War, TASHKENT, Aug 08, 2001 (Itar-Tass via COMTEX). 22 The Washington Post, 25 May 2001. 23 CIA AGENT ALLEGEDLY MET BIN LADEN IN JULY, From 'Le Figaro' [1 November 2001], Translated by Tiphaine Dickson, By Alexandra Richard; Page 2, October 31st, 2001. 24 Washington: Parent of the Taliban and Colombian Death Squads, by Jared Israel, Emperor's Clothes; Posted 5 June 2001. 26 GAPING HOLES IN THE 'CIA VS. BIN LADEN' STORY, by Jared Israel, Emperor's Clothes; Posted 8 November 2001. 33 Citizen, Can I See Your ID , by Al Martin, Al Martin Raw. 34 ATTACK ON THE BILL OF RIGHTS , by Marty Jezer, Brattleboro (VT) Reformer; 10/19/01. 35 From the United States of America to the National Security States of America, by Al Martin, Al Martin Raw. 37 Same Investors, Oil Companies Merge, Poised for War Profits, H. Michael Sweeney, Noilwar.